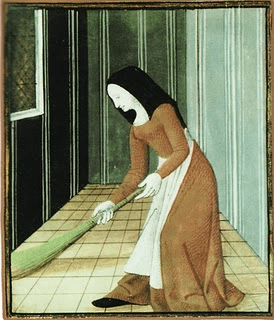 Virid­itas is a guiding theme, used constantly in Hildegard’s works. 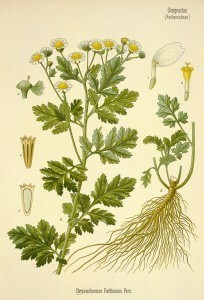 It has been trans­lated in various ways, such as greening, fresh­ness, vitality, fruit­ful­ness, life-force, or growth. It is a metaphor for spir­i­tual and phys­ical health. 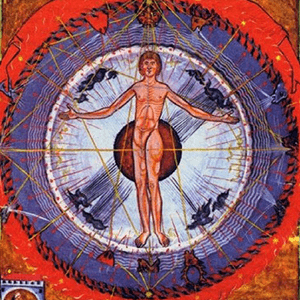 The manu­script image showing the Human Universals described by Hildegard of Bingen predates Leonardo da Vinci’s Vitruvian Man by 350 years. Her medical writ­ings are still consulted by alter­na­tive health prac­ti­tioners, and involve the cura­tive powers of natural objects, including plants, animals, trees and gem stones. Even though she appar­ently suffered from chronic ill health, including migraines, she lived far longer and more vigor­ously than most women of her time — the embod­i­ment of Viriditas. Below are a few connec­tions relating to Viriditas. that earthly excel­lence fails to compre­hend. 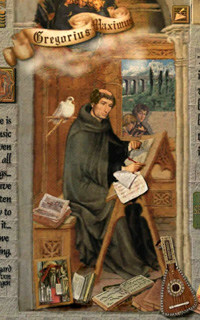 Gregory the Great was instru­mental in promoting and preserving Art and Music within the Church, despite great crit­i­cism. Please see Pope Gregory’s page at Saints Preserved. His feast day is also in September.